Our paediatrician told us about FECS at our local Disability Services centre so we contacted them and Jess was able to go to a group with other babies up to the age of one, with DS. This was confronting but also comforting. It was great to see what the other babies were doing and talk to the other mums. Jess achieved her milestones e.g. 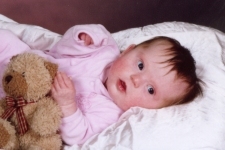 Jess rolled from her tummy to her back at 12 weeks, she sat unaided at 7 months, she reached out to be picked up at 8 months, commando crawled at 9 months and she stood holding on at 9 months. Each month we would take Jess to see the cardiologist. Each month the cardiologist would tell us that her surgery would be the next month. That month would pass and we would be told the same thing at the next appointment. It was so hard to deal with. Everyday we would expectedly look in the mailbox for a letter from the hospital. We received an information pack about the cardiac unit but no booking. We read the booklet from front to back multiple times. There was a phone number of a nurse we could call. In desperation I rang her. The nurse told me that it was not the cardiologist who made the decision, it was the cardiac surgeon. Each week/month he would look at all of the cases and decide who was the most urgent. During this time people in our church were praying for the healing of Jessica's heart. But what did happen was....God kept Jessica's blood separated by the pressure in her heart being at the perfect rate. This should not have been happening. The cardiologist was always amazed by this. Because her blood was kept separate she was fairly well - no blueness and only a little fatigue. Over the next 6 months we did see Jess start to deteriorate - mainly in her level of fatigue and amount of sleeping she was doing. We got the hospital booking letter when she was just over 7 months old. Jess acted like a typical baby in hospital. She slept and breastfed well. But once we got her home she changed. She slept all the time and I could not wake her up to feed her. This was really scary! We didn't know what to do and the chemist clinic nurse wrote a letter for us and told us to take her back to the hospital straight away to seek their advice. We arrived at the hospital and the nurses were horrible. They were rude about the letter and made us feel inferior. We did know what we were doing - something was wrong! They did contact the paediatrician who was on holidays. The paediatrician told them to show me how to force feed Jess with a bottle. If that had not worked then she would have had a feeding tube. Jess also had jaundice so we placed her bassinet by the sliding door in our lounge room, would force feed her with the bottle and try not to worry about why she was sleeping so much. I took tablets to help me produce milk and I would express so she could have breast milk. 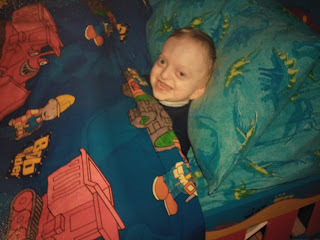 (I was able to provide breast milk to Jess by taking the tablets and expressing, for 6 months - I was determined due to babies with DS having low immunity). When she was awake to breastfeed, Jess would often release from the breast and milk would squirt across the room. At the time, not having the diagnosis, I did not know that this was because of the low tone in her mouth due to the Downs. (Once we got the diagnosis it all made sense, as did all her behaviour! I perservered with the breastfeeding until I realised that Jess found it too hard. She was distaching constantly and she was chugging the bottle....so I went with expressing and the bottle). When Jess was 4 weeks old we took her to see the geneticist. The geneticist straight away laid her on the examination bed and started moving her legs and arms. I was wondering what was going on and why was she doing that? That hadn't been done with the other children. She was actually testing Jess's floppiness - a major indicator of Down syndrome. All was quiet. She then asked me what I thought Jess had. I said that I thought she had a mild form of Crouzons. The geneticist bluntly stated that she wanted to do a 'Chromosone test' plus the 'DNA test for Crouzons'. The chromosone test was to test for Down syndrome as that was what she thought Jess had. She said that she was very surprised that no one had mentioned Downs to us. I felt a chill go through my bones. This was not what I wanted to hear. Upon hearing this, a vivid memory instantly came back to me....when I first held Jess and looked into her almond shaped eyes I had the first chill go through my body as I thought that her eyes looked like she had Down syndrome. But because no one mentioned Down syndrome whilst we were in hospital, I had pushed the thought away to the back of my mind. I didn't want to go there. I didn't want Jess to have Downs. 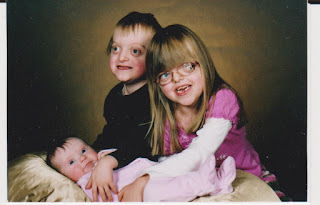 I did not know at the time, but my husband had looked at her eyes at the birth and thought the same thing...that she had Down syndrome...but he unlike me, didn't mind if she had Downs because he had a grown up cousin who he played with as a child, who had Downs. Downs was not an issue for him. Jess had her blood tests and we waited for the chromosone test to come back. My friends came over and prayed over Jess and nobody said that they thought she had Down syndrome. They all thought the test would come back negative. That night we googled Down syndrome and read about all the different forms. We prayed that if she had the syndrome that it would be the mildest form - Mosiac. The results came in the form of a phone call, the next day. The phone rang and my husband and myself argued back and forth over who was going to answer it. I did. I held my breath whilst the geneticist told me the results....Yes Jess had Trisomy 21- she had 3 of Chromosome 21 in all of her cells - it was the most common form, not the mildest. She had Down syndrome. I cried and went into shock. I did want to hold her or look at her. I didn't want anything to do with Jess. I am very ashamed of my reaction. It took a few hours for me to come to my senses. I had to give myself a good kick up the backside because Jess was the same baby after the diagnosis as she was before, so why shouldn't I love her as I was a few hours before? At six weeks I went back to see the obstretrician for my post-checkup...and we took Jess to see the paediatrician for her checkup. I told the obstretrician and he was sympathetic. I also asked him what was the statistic of me having a baby with DS from the 13 week tests. He said '1 in 5'. You know he did not tell me that statistic at the time. We were very unhappy with the paediatrician and asked her why she had not picked up the Downs. She said because she was looking for Crouzons...that was it. We actually think they both suspected DS (that's what the whispering was most likely about) but neither wanted to tell us....they left that job for the geneticist. We then had to wait for the DNA test to come back on the Crouzons, as there was still the 50/50 chance of her having Crouzons as well due to it being a different chromosone that would be affected. God in His wisdom did not allow her to have the Crouzons which is an absolute blessing for her. This diagnosis challenged my faith yet again. I had prayed for Jess to not have Crouzons, and she didn't. But I was angry with God for letting her have Down syndrome and I told him so! It wasn't fair on her. It wasn't fair on me. It wasn't fair that I now had 3 children with disabilities. My life would not be the same as any other mother's in the entire world. I didn't like that. But I made the decision - I could either be angry with God and turn away again, or I could dig into my faith. I decided on the latter - to turn towards God. I didn't understand it. I didn't like it. But I would have FAITH. We were content with our two adorable pigeon pair children. But then one day I saw the big '4 0' approaching and I suddenly became very clucky. Joe was happy to try again. One month later I was pregnant - too easy....before I even had a chance to change my mind which I was in the process of doing! The baby was due on the 15th of April, 2007. I had the nuchal translucency scan and blood test at 13 weeks. The scan began with the technician saying 'the baby may have Down syndrome' because he/she had the thickening of the back of the neck. We explained to her that Melissa and Nick also did. On further investigations the baby did not have any other Down syndrome indicators e.g. lack of nasal bone, the bones in the legs were the right length, the heart was fine etc, so Down syndrome was not discussed again. The technician reported that the baby most likely had Crouzons. We were disappointed but ok with that. We knew what we were dealing with. 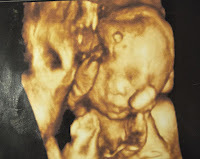 At the 21 week scan, shown here, the technician changed her mind and said that the baby may not have Crouzons at all. This was because her eyes were only slightly wider then the average baby. Nick's at his 18 week scan were two and a half times wider then the average baby's. 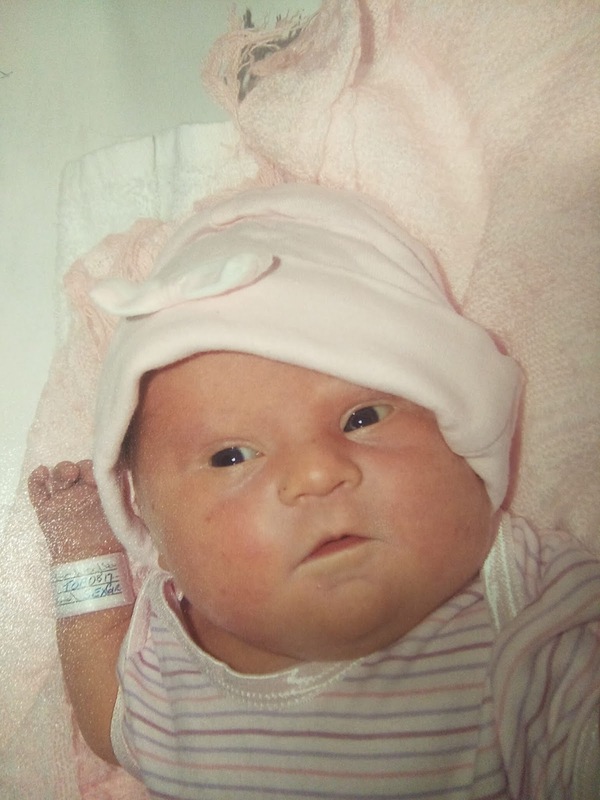 At the final scan which was at 30 weeks, the findings were that the baby's sutures were still open and that her eyes were the same width apart that they were at 21 weeks. This was very good news. But her eyes were prominent which they should not be for 30 weeks. So the final report was Crouzons. That was what we went into her birth believing that Jess had. Jessica was born at 8:17 am on Wednesday the 4th of April, 2007 by c-section. She was breathing and healthy. During the next few days we would see the obstretician and the paediatrician looking at Jess, moving her arms and legs, and whispering. Not loud enough for us to hear. They never explained what they were whispering about. When we questioned the paediatrician as to whether she thought the baby had Crouzons she would say that she wasn't sure. She told us that all of Jess's sutures were still open as they were in the last ultrasound, though her lamboid suture may have been in the process of fusing. Her eyes were also not really prominent but were slightly wider apart then the average. Jessica did have a gap between her big toe and her second toe which could be an indicator of Crouzons. 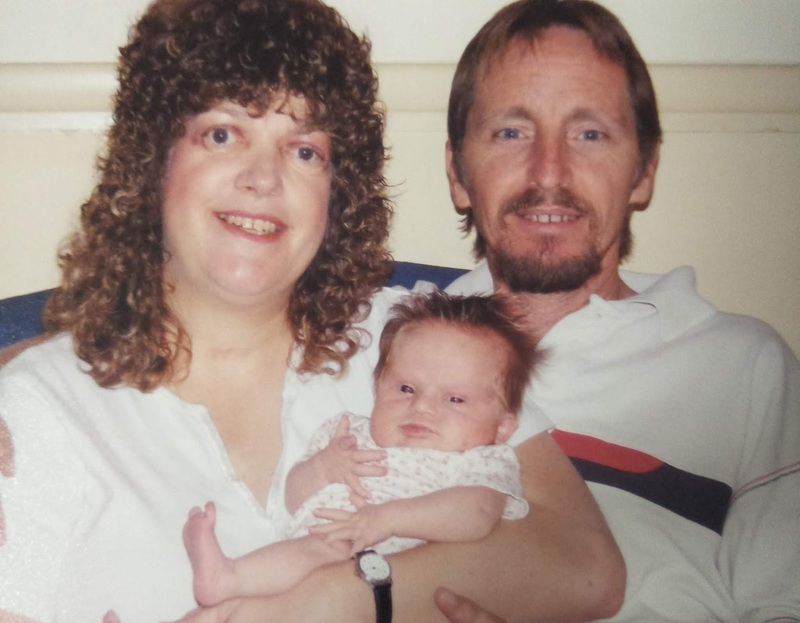 So no diagnosis or hint of a diagnosis was made in the first week of Jessica's life. We went home not knowing. 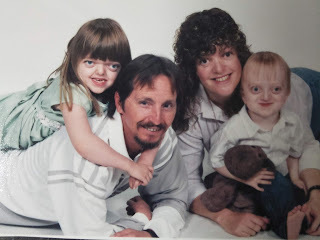 Down syndrome was not mentioned once whilst we were in the hospital. We put Jessica in her pretty going home outfit and proudly took her home, showing her off to family and friends. This story begins with Nick's routine eye examination with our ophthalmologist. We missed the actual appointment due to not receiving the appointment letter so were re-scheduled to a couple of months later, on the 26th of May. Upon examination of Nick's eyes Dr Forrest said that his optic nerves were swollen again and that he would contact the neurosurgeon. He told us to go home, don't worry and that someone would be in contact with us. Well as the story of our life goes, no one from the hospital rang us. So as we have learnt over the years we made our own appointment to see the neurosurgeon the next week as it had not been done on our behalf. My husband Joe took Nick in to see the neurosurgeon. He had not been told about Nick and there was nothing written in his file to tell him what was found. So Joe explained what the ophthalmologist had told him. The neurosurgeon asked whether a CT scan had been arranged, which of course it hadn't. The neurosurgeon then said that he would organise it and we would see him after it was done. Well for two weeks we waited for the appointment but did not receive one, so I rang the hospital and found out that Nick did have an appointment but it was in 4 weeks time, on the 29th of June. We were a little concerned about how far away the scan was but we knew our hospital system and how hard it is to get a CT scan appointment. We also had faith in our doctors that they had Nick's best interests at heart. I must make the comment here that during the weeks that we waited for the CT scan we noticed Nick's behaviour in particular change. He changed from his placid self to a boy who threw a lot of temper tantrums and who got upset easily and who had mood swings. His speech also deteriorated. We went from understanding about 90% to understanding 10% of what he was saying. Nick's veins on his forehead also became much more visible and his little soft spot bulged and pulsated. These changes towards the end made us quite concerned. We were also concerned because we know swollen optic nerves can cause blindness but we didn't know how long it takes for this to happen. The neurosurgeon put our worries at ease and said that it takes a long time for this to happen. Nick was admitted to hospital on Thursday the 29th of June, for the CT scan. While waiting I checked that the ophthalmologist was going to be there because another thing we have learnt over the years is that you cannot presume that things have been organised as you are told that they have been. The ophthalmologist registrar was in the CT scan room which was pleasing to see when Nick arrived and she looked at his eyes when he was under sedation before he had the scan. Nick was given gas to sedate him which worked really well and he woke up quite quickly afterwards. The ophthalmologist registrar told us that Nick's optic nerves were still swollen. We then had to wait for the neurosurgeon to be in contact to let us know the outcome of the scan. I always find the hardest part of being in hospital is the waiting for the doctors to come and see you. This is because you never want to go too far incase you miss them but often they say they are coming but they don't arrive. We waited for a couple of hours and then asked the nurse if she could find out when the neurosurgeon would be coming to see us as we knew that he had a clinic at the hospital at midday. We were told that the results were not in yet for the CT scan but that we would be notified when they were ready. As it was approaching midday when we knew the neurosurgeon would be there, we again asked the nurse what was happening. She rang the neuro's nurse and we were told that the results would not be in for hours but that the registrar had gone to look at the scans. We knew that the neurosurgeon leaves after his clinic and we didn't want to be forgotten about so we went and sat outside his door. The registrar saw us there and told us that he had gone to look at the scans and would see us in a minute to tell us what was going to happen. He then came out and said that he had to go but would be back in a little while to tell us the results! More waiting..... my husband Joe went and got us some lunch and brought it back and we sat and waited for the registrar to return. Which he did eventually. The registrar told us that the CT scan looked fine so the next step was to insert a ICP probe into Nick's brain and put him in ICU for 2-3 days to measure the amount of pressure that was in his head. If there was no pressure in his head then the swollen optic nerves were something to do with his eyes. If he had ICP then surgery would most likely be the outcome. The registrar told us to come into the hospital at 8:00 am the next morning and that he would operate on Nick at lunchtime. We arrived on time but Nick was not operated on until 5:30 pm. We ended up being admitted to the ward while we waited. Nick went into surgery at 5:30 pm and we waited, not knowing how long the operation was going to take (we had forgotten to ask). After a couple of hours we went to ICU and asked whether Nick was there - he was just about to arrive. The ICU nurses called us when he was ready to be seen. Nick was not too happy in ICU and had painkillers during the night and for the next morning. He had the usual ICU monitors attached to him plus the ICP probe which was attached to a monitor as well. Nick spent 2 nights in ICU, with me sleeping (more like dozing) in a recliner rocker beside his bed. Nick was supposed to have spent another day in ICU but he moved too far on the bed and the probe became detached from the monitor. When the nurse tried to make the monitor work again after she reattached the connections, it would not. The ICU rang the techs for the monitor but it still would not work. So on consultation with the neurosurgeon's registrar the probe was taken out and we were sent the ward. What the ICP probe showed was that Nick was getting quite high pressure in his head (readings up into the 50s - we were told that normal was below 20) when he was sleeping. He also showed high pressure when he was upset (which we were told was quite expected) and a couple of times that I saw, was when he stood up. We then played our waiting game again to find out what was going to happen next. The next day which was 2 days after leaving ICU the neurosurgeon came. As it was the holidays he was extremely busy which I can completely understand, but to be honest it was a very long two days, waiting, wondering,... fasting, not fasting...... then wondering when the neuro was going to show up. Nick too wasn't the best of patients exhibiting a lot of temper tantrums and yelling at me which was hard to deal with in front of other people. The next day, being Wednesday, the neuro's registrar came to see us and told us that Nick would be operated on Thursday morning. I was really happy to finally have something done. We were then moved from the medical ward where we had been staying to the surgical ward. Nick fasted from 6:30 am Thursday morning and went to Theatre about 1:30 pm. It is interesting to note that the hospital was having its 75th birthday and I was invited as a special guest as I had been through the hospital as a child with my Crouzons and now the kids are. But because of preparations for Nick's op and he not being able to eat, I was unable to stay very long which was a shame. Nick was in theatre for two and a half hours. The neuro's registrar who performed the surgery found that the shunt, once again, was indeed blocked. The third ventricle apparently was too full of fluid. So a brand new shunt was put in (the time before just the catheter was replaced). Nick went back to the ward afterwards to recover. We were told by the neurosurgeon that we would be able to go home on the following Monday. Saturday rolled around and Nick was so good that the neurosurgeon said we could go home which was wonderful. A week later we took Nick to our family doctor to have the stitches taken out of his head. 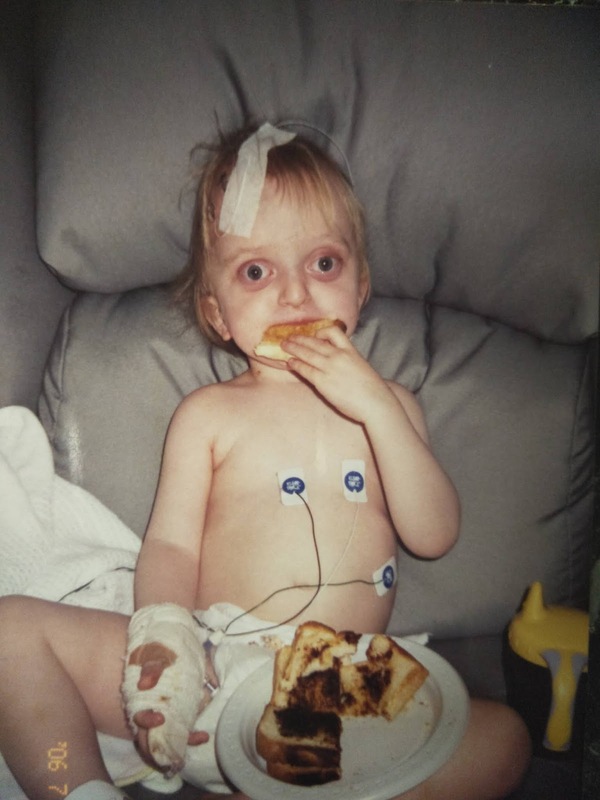 Melissa had been seen by the doctors at the Respiratory Unit since she was about two years old. Her breathing was being monitored regularly and particularly how she was sleeping. Sleep apnea is a common symptom of Crouzon Syndrome because of the small nasal passages and the recessed mid-face. Melissa underwent two sleep studies which confirmed that she had mild sleep apnea and that it was becoming more severe. We noticed that her sleep patterns were changing and she was waking up between 2 and 4 times a night. When she was asleep she would snore loudly and we could hear the apnea episodes. Melissa was often quite tired in the mornings and was regularly irritable and un-cooperative. We were hoping that with the removal of her tonsils would be her bad attitude! 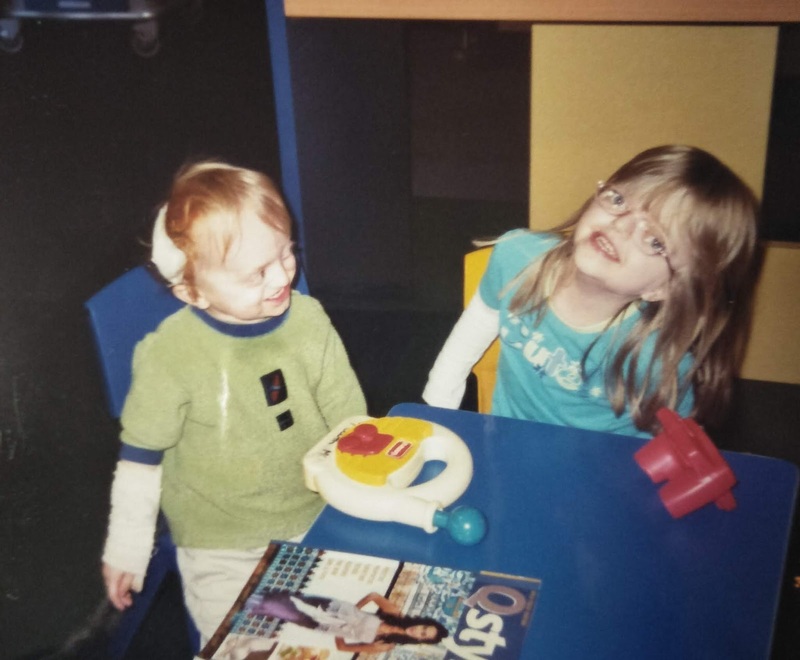 The doctors decided that Melissa needed to have her tonsils and adenoids removed as they were of a moderate size and would be contributing to her sleep apnea. They were obstructing her breathing. 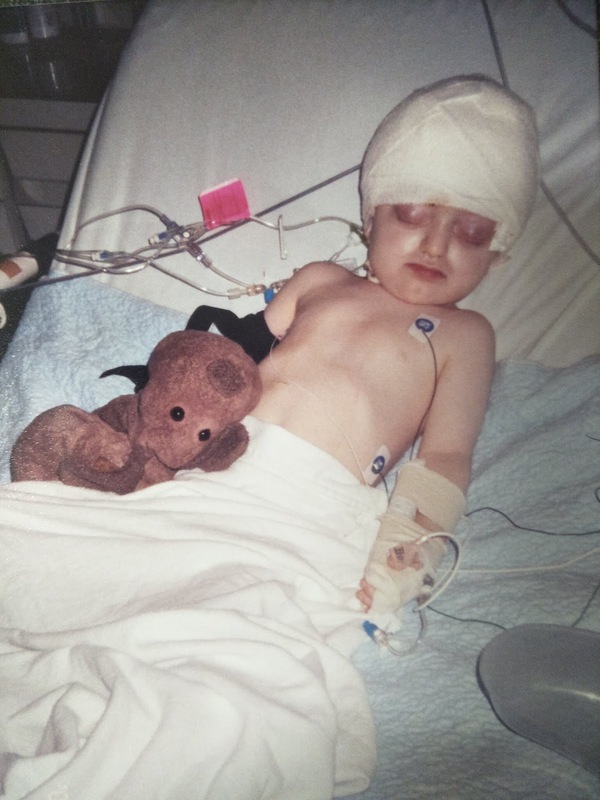 The operation was scheduled for early 2005 but due to four cancellations, 2 by us and 2 by the hospital, Melissa underwent the surgery on October 21, 2005. Melissa fasted from 7:30 a.m. and was admitted into hospital at 11:30 a.m. She underwent the surgery at 2:15 p.m. and by that time was quite hungry! Melissa rode a car into the theatre waiting room, which is what she did for her last two operations. I held her hand as she was put to sleep and kissed her and told her that I loved her. I was very good and didn't cry this time. It's always hard to let your child go into the hands of the surgeons but when your child needs the surgery you put your faith in the doctors and you trust that God will look over everything and keep your child safe. We were told that the operation would be half an hour and not to go too far. So we dashed down to Subway and grabbed some subs and brought them back to the parent's waiting lounge. We were starving as we had not eaten properly since breakfast (I had snuck out for a muffin and a coffee while Melissa was playing in the Day Surgery Unit) but Joe had not eaten at all. After about an hour we were starting to wonder what was happening and as time went on we were getting a little anxious. But from previous surgeries we know that they often take longer then what we are told. About 4 p.m. the nurse came in and told us that Melissa was settling into ICU. We went to see her and she was awake and distressed. Melissa was put into ICU because she had had some apnea episodes during the operation and it was best that she be monitored for the night. I spent the night in a chair beside her bed and didn't get much sleep. She had a rough night waking a lot in pain. Her heart rate also kept dropping and the alarm on the monitor rang all night. The nurses were not too concerned about this as they said that sleep apnea can cause this. The next morning Melissa went to the ward. We were told that she could go home when she ate and drank something. Her heart rate did not drop again after this. Melissa did not want to eat breakfast or drink anything in ICU and this continued for the day. Late Saturday afternoon she had vomiting and was given anti-nausea medicine. Bleeding is a major risk with having tonsils removed but there was no blood in the vomit which was really good. The vomiting stopped but Melissa was not interested in eating or drinking. Nothing would tempt her. Before the operation she was all excited about having jelly and ice-cream post-op but she did eat either whilst in hospital. We were told again on Sunday that if Melissa ate and drank then she could go home. But she was still not interested in doing either and no amount of encouragement would tempt her. We had brought her a bag of jelly beans and she did eat a few of them in the morning but that was it until dinner. Melissa did have a slight temperature but we were told that that was quite normal for after an operation. The ENT doctor came to see Melissa in the afternoon and asked us whether we wanted to take her home but we did not want to take her home whilst she was not eating incase she didn't eat or drink at home either and we would have to bring her back to be re-admitted. Sunday night she finally ate some roast beef and mashed potato for dinner and she told me that she was bored and wanted to go home. This was good to see and hear! I thought yippee tomorrow we'll go home early in the morning! Monday morning came and the ENT doctor came early to see Melissa. She had not eaten anything and he said to encourage her to eat breakfast and some morning tea and if she did that she could go home. She did eat a small amount of cereal and she drank a glass of chocolate milk which she ate because of the reward of getting stickers. The ENT doctor came back about 10:30 a.m. and we told him what she had had. He said that she should eat something rough before she could go home. She ate a chocolate biscuit which she got more stickers for. For lunch she ate a quarter of a sandwich. We were trying to encourage her to eat more but that only led to a temper tantrum. So we resigned ourselves to the possibility that she was going to be in for another night. After lunch the ENT doctor came back again and asked how she was going. By this time we were quite frustrated and getting emotionally worn out by everything. The doctor asked Melissa what did she really want to eat. She said another chocolate biscuit. He said that because that was rough that once she had eaten that she could go home and if she didn't improve at home then to bring her back. It took Melissa 2 hours to eat the biscuit but she eventually did, so we were gone! Melissa ate fries for dinner which is one of her favourite foods so we thought that she was probably o.k. She didn't eat a lot Tuesday but each day she would eat more. At home Melissa needed Pain stop (codeine) to help her to be able to eat but we saw an improvement each day. We also saw a change in her sleep patterns. The waking up during the night eased with it down to at best once a night. We also heard a difference. Melissa's voice sounded quite different though it's hard to explain how it had changed. There differently was more air in her throat. Still very cute though sometimes hard to understand. Melissa went back for her follow-up checkup 4 weeks later. All was good. We took Melissa back to see the speech therapist and she underwent quite extensive work on her articulation. The therapy made a huge difference and we began to be able to understand her. And with us being able to understand her came a decrease in her temper tantrums. This story begins with Nick bumping his head on a plastic dog. Nothing significant we thought. He did not cry, only uttered an 'Ow'. A little while later we noticed a bruise and then an egg form on his forehead. We watched this carefully and noticed that the egg began to disappear and it became squishy. We then noticed that the fluid which was squishy began to fill half of Nick's forehead. This raised alarm bells in our minds. Even though Nick appeared to be fine we knew from the previous time that he does not display the classic symptoms of VP shunt blockage so we contacted the neurosurgeon to have him looked at. The neurosurgeon saw him a few days later and admitted Nick into hospital immediately for a CT scan. He was not happy with the fluid and the fact that the VP shunt valve was very slow to fill and empty. Joe rang me at work and said what was happening. Joe had to leave the hospital to come and get me from work and pick Melissa up from Kindergarten. Nick wasn't allowed to leave the hospital as the opthamologist wanted to look at his optic nerves to check the pressure on them. So Joe unwillingly left him and came to get us. When we got home I hurriedly packed a bag to take to the hospital so I could stay with Nick. I know that I have done this packing thing quite a few times as I went into auto pilot and did it really quickly. Nick apparently wasn't too cooperative for the opthamologist but from what he could see he didn't think Nick had pressure on his optic nerves. The opthamologist would look again when Nick was sedated for the CT scan. Nick stayed in overnight and had to fast from 4am. He was booked in to have a CT scan had 10:30am the next morning. The next morning he went to have the CT scan but we were told that the computer that runs the CT scan was not working so the scan could not be done. No time was given for when it would occur. Nick was allowed to drink some water and apple juice but nothing else for the rest of the day. At 5pm he was taken back for the scan. The anaesthetist came and sedated Nick. The opthamologist came and had another look at Nick's optic nerves. He said that Nick's optic nerves look different to 'normal' optic nerves but he was fairly sure that there was no pressure. That was good news. We then had to wait until the next day to get the results of the CT scan from the neurosurgeon. We waited until 2pm the next day for the neurosurgeon's registrars to come and see us. The neurosurgeon had gone on holidays. We were told that because of Nick's previous blockage that he would be operated on the next day. I rang my mother from the hospital to arrange for her to babysit Melissa for the day. An hour or so later the doctor rang the ward to talk to us. We thought it was to give us the time for the surgery. My husband went to talk to the doctor. I wondered why he was taking so long. When Joe came back to me he said that the operation was cancelled and that we were to go home. The reasons for this were that the CT scan showed that the ventricles were smaller then the last scan and the fluid which was on the scan did not seem to be connected to the cerebrospinal fluid and was most likely just swelling. The doctor was not 100% certain what it was. He also said that the valve was not emptying quickly most likely because the brain is pressing on it. We were happy that Nick did not need another surgery but it was another emotional roller coaster. You go from being rung at work to say he was being admitted and the adrenalin kicks in. You have in your mind that your child is most likely going to have more surgery and you deal with the emotions that go with that. Then you wait...wait...wait....for tests and scans and then the results. This part can be torture in itself. Then to be told that there will be definitely be surgery so you start planning the next day and the things that need to be organised plus the adrenalin kicks in again. Then to be told to go home, change of plans, you experience more emotions particularly when you haven't got any specific reasons for the fluid being there. But you try really hard to trust the judgements of the doctors. Though this time was not as bad as when Nick was to have his frontal orbital advancement and he was all ready for surgery with his IV in and then it was taken out and he was sent home as there were no spare beds in PICU. Nick went for his follow up with the neurosurgeon two and a half weeks after we came home. We were quite concerned about the decision that had been made to not operate, but over the ensuring two weeks we noticed that the swelling subsided, so this eased our concerns. The neurosurgeon looked Nick's CT scans over and agreed with the decision that was made. He would not have operated either. This was good to hear. He said that Nick's ventricles were small which meant that the shunt was working well. He told us that the reason why the swelling took up so much of Nick's forehead was most likely due to the fact that the skin on Nick's forehead has not adhered to the skull bone (due to his previous surgery in November 2004) so it was able to move wherever it wished. Nick's skull bone seems to be fine and the brain is pressing on the shunt valve but while the shunt is working nothing will done about this. Whether this happens again, time will tell. My husband and I were finding life way too hard to deal with alone. The friends we thought were friends were nowhere to be seen whilst Nick and Melissa were in hospital. We felt very much alone. The sore festered when we saw other babies/children inundated with visitors. It was in this time of loneliness and extreme stress, that I suggested to my husband that we join a church. One of the teachers responded that she did, and we made plans to visit her church. Our friend wasn't going the next weekend so we planned to go the following weekend. In that time we had a visit from the Pastoral Care Pastor. We had afternoon tea together and he sat and read with Melissa and Nick. Before he left he gave us some money. We were blown away by his caring, his kindness, his compassion and the monetary blessing. We did not get to church until after Nick's next operation which is explained below, but the Pastoral Care Pastor came and visited us at the hospital. This meant so much to us. We were told before leaving hospital in February that Nick's shunt could stop working at anytime. We were also told that there are classic symptoms to look for (as outlined on my Hydrocephalus page) or there may be nothing really wrong but we'll know that something is not quite right. About 6 weeks after Nick had his shunt put in we noticed that Nick's head was starting to change shape again. To begin with Joe and I thought this to ourselves but did not mention it to each other. Then one day I said something to Joe and he said that he had been thinking the same thing! Before Nick had his shunt put in he had a very bulgy looking forehead, with bulging pulsating spots where the soft spots were. After Nick had his shunt put in this all disappeared. His forehead lost its bulginess and the soft spots became dents. What we both noticed was that these dents were become bulgy again. We then noticed Nick's forehead become bulgy and higher. The skull bone infront of the scar was becoming higher then the skull bone behind the scar. And in the last couple weeks before his operation we noticed that more holes were appearing in his forehead. We also thought that Nick's eyes were becoming more bulgy. The more we observed him, the more we became worried. But we weren't too worried as Nick was happy and showed no other signs of intra-cranial pressure e.g. vomiting, headaches, delayed development etc. Before he had his shunt put in, Nick stopped talking and had headaches. We made an appointment to see the neurosurgeon to discuss our concerns. He looked at Nick but wasn't too concerned. He booked Nick in for a CT scan to see what was happening with the ventricles in the middle of the brain. He told us that if the ventricles are enlarged then the fluid is not draining away and thus the shunt is not working properly. Nick had the CT scan. We went back to see the neurosurgeon 2 weeks later for the results. He said that the shunt was in the correct place and that it was working properly. He was not prepared to operate based on these results. We were unhappy with this as our gut instinct was that there was something wrong. Nick's head in this time had become more bulgy and we were sure that the skull bones were being pushed out of shape. We put forth our concerns about his head shape and were told that this re-shaping of the head sometimes happens after frontal orbital advancements and that it was unrelated to his hydrocephalus. Based on our concerns the neurosurgeon sent us to see the plastic surgeon for his opinion. We saw the plastic surgeon the next day. He agreed with us, that yes there was a problem. He believed that the changed head shape was probably due to the shunt not working properly. The plastic surgeon measured Nick's head and it was the same size as Melissa's who is 4 years old. On his baby chart his head size had gone from the 50th percentile to the 98th percentile. We also told him that we thought Nick's eyes were becoming more bulgy and could that be the hydrocephalus or just the Crouzons. He didn't think that the Crouzons would make his eyes more bulgy that quickly. The plastic surgeon then sent us to see the opthamologist for his opinion. We were booked in to see the opthamologist on the following Monday but he put his back out so we had to wait a week. On the Friday Joe arrived at the hospital early with Nick. The opthamologist examined Nick's optic nerves and said that the pressure was higher then when he examined him last (a month after he had his shunt put in), so in his opinion there was a problem with the shunt. This confirmed our instincts. We then had to wait for the hospital to organise what they were going to do. We thought that we would have heard straight away from the hospital but we didn't. Three days went by and we heard nothing. Joe rang the hospital and talked to the sister who we liaise with but she knew nothing and said that nothing was written in his chart. We started to get more worried as that morning we could not wake Nick. He normally would be awake by 6 am. At 7:30 am he had not woken so we opened his door, called his name, rubbed his head and tried to rouse him but there was no response. This had never happened before. We were going to ring the ambulance but Joe decided first to try and sit him up. This worked and Nick woke up. This scared us! If we did not get answers very soon we made the decision that we would go to the hospital's Emergency Room and wait there until we did get some answers. But the next day one of the doctors rang to say that Nick would be coming into hospital and he was organising everything. The doctor said that he would ring us back. That was 12:30. We waited the rest of day in anticipation of the call. At 8:00 pm the phone rang. Nick had to go into hospital the next day (Wednesday) for blood tests. He would then have a CT scan on Thursday and depending on the results of that, be operated on Thursday night or Friday. We were concerned about Nick's health as he was on antibiotics for a throat infection. His blood results were fine and the doctors who examined him said his chest was clear and that he didn't have a temperature, so he was fine to go ahead with the CT scan. Nick went into hospital the next day for blood tests. Joe took him and I went to work. At 3 pm Joe rang me at work and said to come to the hospital as Nick was staying in overnight. I rushed home, packed my bags and got a lift from one of my lovely fellow colleagues to the hospital. Joe was out the front of the hospital when I got there and said that we could go home for the night but we had to be back the next morning for the CT scan. I was slightly annoyed about being stressed out but was happy not to have to sleep in the hospital for the night. We were at the hospital at 8 am the next morning. Joe dropped Nick and I off at the hospital. He took Melissa back home to kindergarten as we didn't want her hanging around the hospital all day. It would have been very boring for her and stressful for us to try and entertain her as well as worrying about Nick. We did not have a babysitter. Nick was sedated for the CT scan. He fought the medication as hard as he could. Nick had the CT scan at 9:15 am. We then had to wait for the neurosurgeon to come and see us. At 1:30 pm he came. The neurosurgeon said that the CT scan was the same as the one he had a month before and that in his opinion it was working properly. (In the moment before he spoke his next sentence, I was thinking that he had better operate on Nick.....) He then said that because he had pressure on his optic nerves that they were going to put in a different type of valve in the shunt. In the shunt the value fills up with fluid and then drains it away. It is triggered by the pressure in the brain. The neurosurgeon explained that Nick had a medium pressure valve and that they would replace it with a low pressure valve. The analogy he gave was of turning on the tap more. This pressure would drain fluid away quicker. We were satisfied with that. He then said again that he didn't think the shape of Nick's head was related to the hydrocephalus. When I questioned him on when he would be operating on Nick, the neurosurgeon replied that he was unsure - possibly that night or possibly the next day. He said that Nick could have something light to eat and something to drink (which he had had already). Joe went home at 1:30 pm to collect Melissa from kindergarten and we decided that he would stay home until I rang. Nick had a sleep and woke up about 3 pm. I asked the nurses if he could have something to drink but they said no as he may be having surgery that evening. I asked them if they knew what time his surgery was but they did not know. At 4 pm I asked the nurses again but they did not know. Every hour I asked with the same response. At about 6 pm I was starting to get impatient and talked to the nurse manager to see if he could find out what was happening. My main concern was for Nick. He was getting lethargic and hadn't had much to eat or drink in 24 hours - I wanted to feed him if the operation was not on. In 24 hours Nick had only had 150ml of milk and 3/4 of a sandwich. The nurse was very concerned about him becoming dehydrated, so an IV was put in and Nick was given saline. We still didn't know what was going to happen. At 7 pm the neurosurgeon's registrar came to see us. He was very nice and listened to everything that we told him. He told us that the CT scan is just one indicator but you have to look at everything. That is what we thought as parents. He said that Nick was probably going to be operated on that night depending on what happened with another child who also needed a shunt revision. The other child was sicker then Nick so was the priority. Nick was not considered an emergency so the registrar said that if it got to 10 pm he would not operate - he would leave it until the next day or Monday. The doctor admitted that he was tired so I told him that I would prefer not to have Nick operated on very late (I was so proud of myself for asserting myself. I thought that we had waited weeks to get this done so another day would not hurt. A fresh doctor has to be a better doctor). I guess that the doctor was being very honest to admit to being tired but it actually added to our stress. At 9 pm Nick was called. (I had been hoping that 10 pm would come and he would not have been called). The operation took approximately 1 3/4 hours. My husband and I fell asleep in the parent waiting room. I think we were both emotionally, mentally and physically tired from the weeks of worry and trying to get something done to help our son because we were pretty positive that there was a problem. The neurosurgeon came in to the waiting room and woke us up at 10:45 pm and explained that the tube going into Nick's brain was blocked. I guess this is called the ventricular catheter. The pressure valve did not need to be changed. We were so relieved to know that our instincts were right and that we had not taken the neurosurgeon's initial diagnosis that everything was working. We knew as parents, that even though Nick did not have the classic symptoms, that were was a problem. We just wished that it had not taken 5 weeks to be fixed. I was told by a friend when Melissa was young, and we were trying to get doctor miscommunications sorted out and operations scheduled and re-scheduled due to hospital cancellations, that as parents it is our job to stick up for our children because no one else will. It is our job to persevere and get doctors to listen to us. Joe and I have found this hard as we are not overly assertive people but we are getting better. We have found that every time we have taken one of our children to see the plastic surgeon with concerns we have been right - there has been a problem. This has given us confidence in our judgements as parents. We did not see Nick's neurosurgeon after the operation. We did not see the neurosurgeon's registrar who operated on Nick either for the rest of the time Nick was in hospital. This annoyed us. Nick had the operation Thursday night. On Friday he was fairly lethargic. Joe noticed that Nick was developing an egg shape around his wound so we brought this up with the ward doctor. He contacted the neurosurgeon who sent us for an ultrasound. The ultrasound showed that it was swelling and that there was no leakage of CSF (cerebral spinal fluid). We were relieved by that. We were told to keep an eye on it and if it got bigger then they would do another CT scan. By Friday evening Nick was getting back to his normal self. We were told that we could go home the next day if we wanted to. Saturday when he woke up Nick vomited so I said that I didn't want to go home until he was well. Nick vomited in February after having his shunt inserted so we were not surprised by this. The swelling didn't seem to be getting any bigger so we were happy with that. Nick was unwell for the most of the day but by the evening was back to himself. On Sunday I told the nurses that I did not want to take Nick home without him being seen by the neurosurgeon or the registrar. I didn't think that it was right that no one had been to see him. The other child who had the shunt revision had gone home Saturday. A different registrar to the one who had operated on him, came and saw him, so we were more happier then we were, and we took him home. It still would have been nice to see the neurosurgeon or the registrar who operated on him. Nick was in hospital for 5 days. On Sunday afternoon Nick pulled his dressing off his head. We were shocked to see a row of about 12 tidy staples in his head. We thought that his cut would have been stitched like it was last time. On the Monday we rang the hospital to find out whether we could take him to our local doctor to have them removed or whether he would have to go back to the hospital. We were told that our local doctor could take them out. Nick's staples came out fine but he wasn't too happy about having it done. The wound healed well. 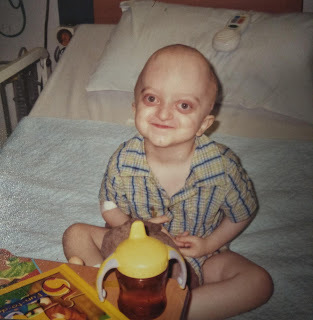 It was a long time before hair started to grow over his shunt so it was very obvious to people that he had something sticking out through his skin. We have been asked many questions about his 'lump' so we have found this an opportunity to educate people on hydrocephalus and vp shunts.